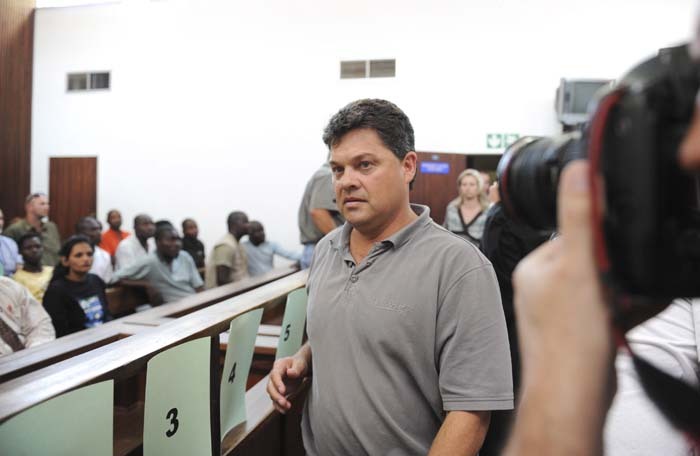 FILE PICTURE: Accused Dawie Groenewald at court in Messina, South Africa on 22 September 2010. Picture: Gallo Images/Foto24/Herman Verwey. A game farmer was allegedly the mastermind behind one of SA’s largest rhino poaching syndicates. A Constitutional Court ruling confirming the lifting of South Africa’s moratorium on domestic trade in rhino horn has resulted in the state having to drop several charges against members of an alleged rhino poaching syndicate. The High Court in Pretoria was on Thursday informed that the effect of the Constitutional Court ruling was that the charge sheet against Polokwane game farmer Dawie Groenewald, his wife Sariëtte and eight co-accused had to be amended. The amended charge sheet has not yet been handed to the accused and their legal representatives said they foresaw that there might be applications for further particulars. Judge Eben Jordaan provisionally postponed their trial to January 29 next year pending the serving of a new charge sheet and negotiations between the state and defence. The trial of one of the accused, veterinarian Manie du Plessis, was postponed to July 17 to await the outcome of his representations to the national prosecuting authority regarding a possible plea bargain. The 10 accused were arrested in 2010 after a 15-month investigation called ‘Project Cruiser’, but their criminal trial was delayed on numerous occasions to await the final outcome of a legal battle about the validity of the 2009 moratorium. Groenewald was allegedly the mastermind behind one of South Africa’s largest rhino poaching syndicates. A full bench of the High Court in Pretoria in 2015 set aside the moratorium, which meant that domestic trade in rhino horn in South Africa became legal, although the international ban on such trade remained in place. The court ruled that government had failed to meet even the minimum requirements of a public consultative and participatory process, and said the level of rhino poaching since the moratorium came into effect was “quite alarming” and there was no evidence that it helped to stop international smuggling. The high court, Supreme Court of Appeal and Constitutional Court subsequently turned down the environmental affairs minister’s application for leave to appeal against the ruling. Groenewald and his co-accused, which include two veterinary surgeons and a pilot, were allegedly linked to hundreds of illegal rhino poaching incidents over a four-year period. They initially faced over 1 800 charges, including racketeering, money laundering, illegal hunting of rhino, dealing in rhino horn and contravening the Biodiversity and Prevention of Organised Crime Act. The trial of another alleged rhino poaching syndicate led by professional hunter and game farmer Hugo Ras has also been delayed pending the outcome of the moratorium battle.